Straight from Australia to you, the condom lifestyle accessory! 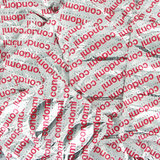 Three CE-marked condoms in a neat camouflage-patterned tin. When the condoms have gone (sooner rather than later!) restock the tin or find another use for it! And hey, check out that price! No more than you'd pay for a pack of three down your local 8-till-late!